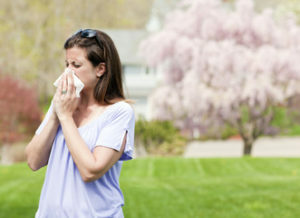 Home » Blog » Is it Allergies – or Something more Sinister? As we notice the flowers blooming and more birds chirping, we know that spring is in the air. Along with it, many people know there are allergens in the air that may just hit them when they least expect it. Allergies can be a nuisance, causing you to sniffle and sneeze. Those are the standard problems that most people associate with allergies. But what if your allergies only affect your eyes? Ocular allergies are bad enough on any level. Because the symptoms of such allergies are quite similar to the symptoms of an eye infection, the problem is compounded. How do you know that is really behind all that tearing and itching? Does it even matter? First, yes, it matters. If you have allergies, you need antihistamine medication to improve comfort. If you have an infection, you need proper medication to address the type of infection you have (viral or bacterial). Otherwise, you risk unnecessary frustration – and also passing along your infection to another unexpecting victim. Also, infected eyes have a thicker discharge than what you would see with standard allergies. If anything, this may be your unmistakable symptom to alert you that something more than allergic reaction is happening. If you are unsure what may be causing redness and itching, see your eye doctor. In addition to treating the condition that ails you, we can discuss how to prevent future flare-ups or problems. Hand-washing is one of the best habits you can institute to minimize your risk of contracting an eye infection. Always wash your hands before touching your face, particularly your eyes. Hand sanitizer is also suitable and may be an easier way to teach children the habit of keeping hands clean. Do you need treatment for an eye condition? We’d love to see you. Contact one of our conveniently located offices today.